Residents of Suwanee, Georgia can enjoy a number of different electrical services and repairs through Bryan Electric. Our reliable Suwanee electricians have experience in everything from exterior modifications and upgrades to complex interior work. Our top priority is accommodating the needs of our customers, and as such we will examine your electrical issues using the most advanced technology available. We’ll come up with the most efficient, cost-effective solution possible to resolve your problem and to ensure it won’t return. We’ll catch even the most subtle signs of other issues. With an overall assessment of your system, we can offer solutions or advice to help you avoid any setbacks later on. In addition to helping you get your electrical system working at peak levels again, we also offer preventative maintenance services that can keep your system working at its best well into the future. For both commercial and residential systems, we will always strive to complete the job in a way that best suits your preferences. Our methods center on helping your electrical system reach its full potential and produce better results while consuming less energy. We use nothing short of the latest equipment to serve our customers, which includes infrared thermal imaging technology. We use this technology during inspections to help your electrical system’s components work at their highest capacity for longer. Using our resources and experience, we detect future issues before they have a chance to interfere with your electrical service. We’ll also help you cut back on energy costs with audits designed to pinpoint sources of wasted energy. If speedy electrical repairs in Suwanee is what you need, Bryan Electric is the only provider you need to call! We even have a 24-hour emergency electrical service, which offers fast response times no matter when disaster strikes. Your electrical system doesn’t only work regular business hours, and neither do we. Call us for assistance, and we’ll bring you the help you need without sticking you with a frustratingly long wait. Our response times are fast, even in non-emergency cases, because we value your time and appreciate your business. We like to take the guesswork out of the equation. Not only will we make sure you know exactly what our rates are before we start working, but you will even get an estimate of how long it will take for our electricians to arrive. No longer will you have to cancel your plans because you didn’t know when to expect a technician. At Bryan Electric, our Suwanee electricians will focus on doing our best to get the job done right, but your convenience is also one of our highest priorities. Emergency repairs and quick, reliable electrical services are a big part of what we provide for our customers, but that’s not all. While we focus on finding effective resolutions to your electrical problems, our Suwanee electricians also do what we can to keep the issues from appearing in the first place. Many electrical malfunctions, particularly the more serious varieties, don’t just happen all at once. They show signs long before the harmful symptoms become visible. Taking a proactive approach is the best way to keep your system in optimal condition. With one of Bryan Electric’s preventative maintenance plans, an expert will catch them early. Our electricians will look over the entirety of your electrical system and figure out where improvements and modifications are necessary. We’ll stop big problems before they can interrupt your service, which not only keeps you from ending up in the dark (literally) but also helps you avoid hefty price tags in the future when key components fail. We’ll help you keep your system running at its best. If new equipment is necessary, we’ll even offer our expertise on what you should get to suit your specific needs. 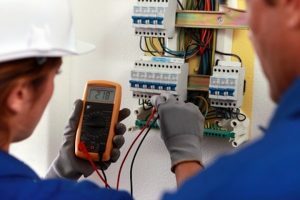 For more information about the range of electrical repairs and services we offer in Suwanee, Georgia, give our team of expert Suwanee electricians at Bryan Electric a call at (770) 680-2144 today.